Winter Retreat Blog Series: Winter Self-Care & Ayurveda with Suzanne! Who doesn’t want that? Am I right? And yet, how hard does it seem for us to carve out some time for dinacharya (daily routines) that are intentional and that hold space for us to develop discipline around our actions? How often do we feel like we are first responders and operating in crisis mode instead of setting up the day in a way that allows for your mind-body-spirit to be supported and centered. Sometimes it may seem like too much to tackle, but start where you are. For those of coming to the retreat, you are in luck because Suzanne is teaching a session about what self-care rituals can support you through the winter and many years to come! In particular she will be teaching about ayurvedic oil massage which is called Abhyanga or self-massage. Let’s just say I have experienced both a massage with ayurvedic oils with Suzanne and have practiced on my own, and it is such an earthly and holy way to get in touch with your body and self, both physically, mentally, emotionally and spiritually. Suzanne brings so much wisdom and knowledge to this practice as she is a National Ayurvedic Medicine Association (NAMA) Certified Ayurvedic Practitioner. She focuses on preventive healthcare as well as heath promotion with a specific focus on diet and lifestyle through traditional Ayurvedic medical science principles and practices. She has gone through a minimum of 1500 hours of training in this area and also brings all her bodywork experience to the table. We are so delighted that she will share in this practice with us, and we are grateful she is making room in her schedule for this time of rest and rejuvenation at the Christine Center. Suzanne and I connected only 2 years ago when I was looking for a local yoga teaching job. She had just left her weekly teaching career to go more full-time with bodywork and further her studies. She linked me up to Just For Me Spa in Stillwater where I taught for a season while I was pregnant with my youngest daughter. From there we started talking. It turns out the office that I was offering herbal consultations out of was her old space! Right away we had an instant connection. In these two short years, which feels like a lifetime, Suzanne and I became friends and I’ve always felt like she is pioneering the path ahead of me. As she is currently deepening her work in the artistic realm, I, too, feel this pull in that direction and have no doubt when the time is right I will follow. Suzanne also has a background in writing, I have a background in writing. She went through herbal studies, I went through herbal studies. Do you get my point? Suzanne also has a heart for the community and making yoga accessible to all people. She approached me late this summer about bringing our first donation based, community yoga class to our studio. She was just starting her second master’s program so she agreed to do it for this first quarter to shake things up a bit and try a new model. A truly selfless and generous person, as well as a person who is not trying to commodify yoga into a business, I appreciate her spirit and the integrity she brings to her work. I hope you, too, will be able to meet her at our 3rd Annual Winter Yoga & Meditation Retreat. This is Suzanne’s first time joining us and I couldn’t be more grateful and excited for all of us. At the retreat: Suzanne will offer an evening session on Winter Self-Care through the lens of Ayurveda on Friday. She will teach abhyanga massage as well as share about marma therapy which cleanses blocked energy in the body through applying touch to different marma points on the body. This session will include the use of 3 luxurious herbal applications to help relax and calm the nervous system. Please make sure you pack 2-3 old towels you don’t mind getting oily, some loose shorts and a t-shirt that can get oily and bring a small little mason jar to take home a little oil with you…if you have any left over! Suzanne will also teach an early morning yoga class on Sunday and will be available for a select number of Relaxation Massages during the retreat. Please contact kali@moonriverwellness.com for booking availability. Winter Retreat Blog Series: Setting an Intention & MUCH MORE with Julia! Our retreat will kick off with an intentional gemstone bracelet making session with Julia! Many people sign up for retreat during this time of year because of the natural tendency to go inward and dream. It’s perfect after the rush of the holiday season to pack your bags and bring the focus back home to the self—to settle into the quiet and restful energy of winter and be. This time of the year calls for the work that needs to happen before we plant the seeds of intention. To set the scene for what’s to come ahead. The good news is that the “work” looks less like work and more like resting, taking good care and not doing too much. Though there will be plenty of sessions available to keep you inspired, nothing is mandatory. It’s all a matter of choice. It’s your time, and we recommend you take a slower pace. Each retreat we like to send participants home with a little gift. According to the Vedas, Gemstones are crystals of power that have a specific ability to aid a person in aligning their energy with the Universal energy. This year the offering will be a lovely gemstone bracelet infused with your energy, empowered within a community practice guided by Julia. Julia is a woman who I respect so much as another human on the path devoted to her practice and living her yoga. She will be joining us for her second year teaching at the retreat. I first met Julia in 2012 when I was in a prenatal yoga teacher training. A pregnant woman doing a headstand caught the corner of my eye and her fiery spirit and outgoing attitude drew me in to eventually grab lunch with her over the weekend training. With both of us having familial ties overseas to different cultures and a strong sense of desire to share with the greater community, I felt an immediate bond to this sister. Over the next 5 years we would spontaneously run into each other in various yoga teacher workshops until we made our meetings intentional. Our professional collaboration began when Julia came to my wellness space before it was a yoga studio (in my upstairs office), and we held two different mala making sessions that were SO MUCH FUN! Her knowledge of gemstones and Vedic Astrology is so deep! I so enjoyed having her in our space and engaging in creative process. We all learned so much. Then flash forward to her signing up for our last winter retreat (this past January). I was so honored to see she was taking time for herself and felt drawn to our offering. Knowing how extensive her background is in yoga (and beyond) I couldn’t not ask her to be a guest teacher...and now the rest is history! I am so excited for what she will bring to the retreat this time around and couldn’t feel more supported to teach alongside this woman. It doesn’t get much sweeter than nestling into the deep woods of Wisconsin, setting your intentions for 2019 while nourishing your mind, body, spirit and heart. Though, we tend to be a bit biased. Stay tuned for next week’s blog about Suzanne and her Ayurvedic Self Care Practice she will offer at the retreat. Be sure to sign up soon, we are filling up fast! Like, as in, only a couple spots left. At the retreat in addition to leading the group creative practice Friday evening, Julia will share a morning yoga nidra practice on Saturday and a special sound healing practice co-taught with Kali on Sunday. Julia will also be available to offer a few private Vedic Astrology Birth Charts + Custom Mala orders. Please make sure you reach out to kali@moonriverwellness.com for booking information. 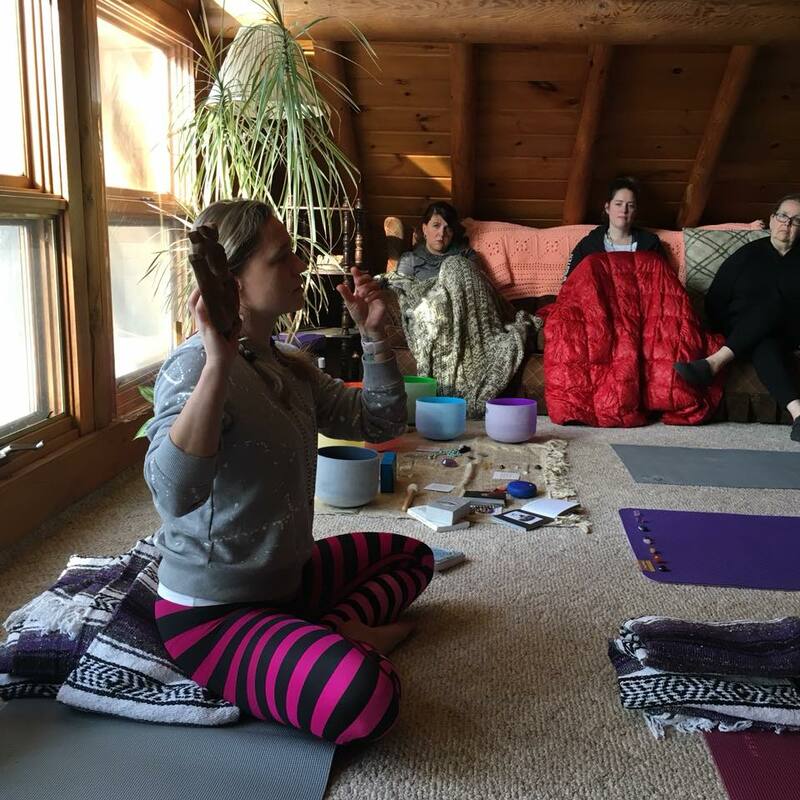 Winter Retreat Blog Series: Meditative Tea Ceremony with Christin! Christin serving an evening tea at our last Winter Yoga & Meditation Retreat at ARC Retreat Center in January 2018. I sit here both in awe and partial disbelief that almost a year has passed since our last Winter Yoga & Meditation Retreat. What a gift and a privilege it is to be able to start our year with intention surrounded by a supportive and nurturing community. There is something magical about this time of year and the people who gather. There is something special about the container and space we create together. Lucky for us, we never need to do much marketing for this event. I think a big part of that is because of this unique attraction that accompanies the powerful season of Winter. Yet, for people who are wondering and thinking about joining us, I thought it might be kind of fun to share a bit about some of the experiences we will offer as well as the people who will be with us. As I think about the meditative tea ceremony that will be offered 4 different times (!) throughout our retreat weekend, I am transported back to May of 2017, when I was 39 weeks pregnant. It was a Sunday…3 days before my youngest daughter was born. After a 40 minute drive I waddled out of my car to my first ceremony, and I knew I was returning home. There was something magnetic about the woman leading this tea ceremony—her name was Christin. I knew of her initially because she was a co-organizer of a gathering in the woods of teachers and seekers that I was to be a part of later that summer. However, I also knew I needed to meet Christin before that gathering. In fact, I found her online even long before that…when I was seeking information about tea ceremony. As an herbalist and a yoga/meditation teacher, I was fascinated by the idea of learning the art of tea ceremony. She was on my metaphysical radar and it was only a matter of time we would meet in person. After experiencing my first tea ceremony with Christin, I felt so much gratitude. I also felt the depth of her own personal practice and integrity create an even deeper experience for me. Christin is one of the most down to earth and straightforward souls I know, and yet she has studied with the Dalai Lama and learned traditional tea ceremony in Taiwan, carrying buckets of fresh spring water long distances, apprenticing with the masters. She is truly an amazing human being, embodying her spirituality with every step she takes. And I could go on and on here, but I’ll try to stop puffing my chest for her and just encourage you to come to the retreat to see what I mean. After the tea ceremony that May, I had my baby, and then I met Christin again in the woods in one of my classes on flower essences that summer. I loved her openness and curiosity. Again, for being one of the organizers of this event, she was such a natural and approachable human. I just enjoy(ed) her so much. We kept in touch online and met up for a meal when it was possible. Though our meetings were infrequent, we became fast friends. Because she is such a good friend, she agreed to bring tea ceremony to Moon River last December and then she served tea on our winter retreat. Now we are lucky to have her return again this year at the Christine Center. Tea Ceremony at Moon River Wellness, December 2017. As I write this now, Christin is in flight to Hong Kong where she will teach a few classes and continue to serve tea at a big international gathering. My heart is so full of gratitude that she will be at our 2019 winter retreat. AND, did I mention? She is bringing a 200 year old tea to our gathering!!! I can hardly wait to let the wisdom of this plant and practice settle into our bones. And I cannot wait to see some of you there! At the retreat: The tea ceremony will take place during the span of a one hour session, with about 45 minutes of watching the tea pour into your bowl, drinking the tea and repeat. It sounds so simple and basic and it is, which makes it so rich, grounding and meditative. You certainly do not have to attend all tea sessions, but if space allows, you could. This year Christin will offer more tea in shorter time periods so that people can choose to practice either in the morning or evening or both. If you have a sensitivity to caffeine, we recommend you practice in the day time. There will be sign up sheets at the retreat to reserve your spot. This blog is the second of a collection called, "Moonbeams: Illuminating what happens here" curated by local writer and community member, Kim Thompson and other guest writers. We hope to offer this "column" 1-2 times a month, sharing about what goes on at the studio to inspire you to come check us out for yourself. This week's post is about one of our teachers, Maria Hermann. We hope you enjoy! Maria Hermann doesn’t just teach a yoga class. Instead, she welcomes people to gather at the sacred space of Moon River, to witness their growth in a communal experience and soak in the colorful drops of wisdom she is honored to share. Moon River, by the way, is a lovely little slice of paradise and Maria proudly extols its virtues. When I first met Maria I felt safe with her immediately, and from there, things just got better. Her 75-minute class Mindfulness Yoga and Meditation, which is currently taught at 7 pm on Wednesday evenings, is not intended to control the outcomes of each person’s experience. Rather, nature will organically plant a rich and compelling seed, a new tool procured. She is satisfied with being one of many influences in their personal wellness. Originally, a back injury and resulting chronic pain initiated her into “body trauma” and the much needed practice of healing. She is, therefore, sensitive to what the body needs and what actually, truly works. Yoga and meditation have become her way of life; she is a great role model for successful repair. Maria’s class isn’t just about one’s physique; although, the body’s health is certainly a vessel worthy of attention. This is also a time for going within, gaining a deeper understanding of our personal self and what it is we are energetically carrying, the way stretching our limbs allows breath to enter, the way holding a pose builds empowerment. Maria likes to create a casual and open atmosphere. It is important to her that people feel relaxed and authentic, without regard for rigid formality. She shared that she “holds space for inner exploration, healing, and transformation in body and spirit. Arrive as you are and discover the gifts of yoga.” There is intentional time to settle and connect before they “breathe together.” It is common to then practice a mix of Yin and Hatha yoga. Yin encourages the slower movements and longer-held poses which apply moderate stress to the connective tissues of the body and increase circulation. This meditative approach cultivates awareness of inner silence – or the realization of a need to purge all that toxic noise and clutter! Hatha helps balance the strengths and weaknesses of the physical body to enable energy and awareness to flow freely. Likewise, Maria infuses her knowledge of Vipassana meditation throughout the class, since it also promotes a way of “seeing”, developing clarity of mind. When one is able to allow their thoughts to flow freely, not judging them but gently releasing them, it effectively conditions a calm that helps us master the meditative experience. Maria understands and guides this possibility. There is no unrealistic need to force a blank mind. Thanks for that, Maria. Maria suggests her class is a time to detox from our electronics, to retreat from draining demands, to manifest what happens when we stop and allow restoration, meaning and a kindred peace. While it sometimes requires true effort to venture out on a wintery darkened evening, one can benefit greatly from the group encounter awaiting them at Moon River. Maria’s students embrace the nurturing energy of their peers. They learn that vulnerability brings insight and the blessings of communal support. We are people, after all, and people need people. Now, doesn’t that sound nice? Kim is a mother of three sons, a Stillwater High School English teacher, local columnist, and freelancer for community interests. Kim is a voracious reader and student of metaphysics and ancient tribal spirituality, gardener and foodie, a motorcyclist, and a poet. Her family has resided in Stillwater for six generations. She is passionately invested in community relationships that promote the health of body, mind and soul.